A dark, somewhat comedic glimpse into the bendable bowtruckle industry. I get up and walk to Harry’s cage. He’s chewing on a thick corn cob, ignoring the sounds in the wall. Elf on a Shelf disappears from time to time, probably to meet with his NSA handler to discuss how much television we binge. I find him sitting on the bench, silently judging me. The noises aren’t his own, unless his communication equipment is malfunctioning, which worries me. I know he has a secret lab in the walls. It’s part of the agreement when you welcome the elf into your home, but I don’t want a spark setting a fire. I sighed, deciding to eat M&Ms and watch tv. Walking over to my recliner, I sat down and reached for the four pounds of chocolate. My hands find nothing but air. A trail of candy leads to the wall. This goes on for days. Candy keeps disappearing, until I caught the thief red-handed. 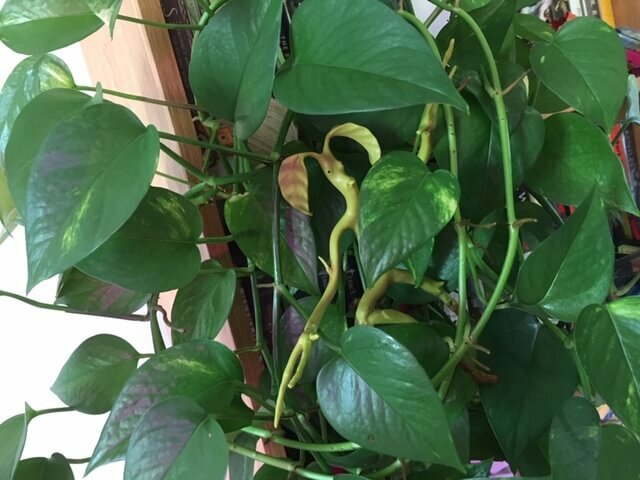 A bowtruckle has been running around my house, stealing candy like a drug addict feeding its addiction. At first it paused, standing still, probably hoping to camouflage with my floor. The bowtruckle dropped the cup of taffy, running towards a bookshelf with a thick philodendron hanging over the side. Vala, my cat, and I watched the creature jump into the philodendron, surrounding itself with green foliage. Calm chirps came from the bowtruckle “hidden” beneath the vines. It seemed to be acting nonchalant, hoping we would ignore the search. 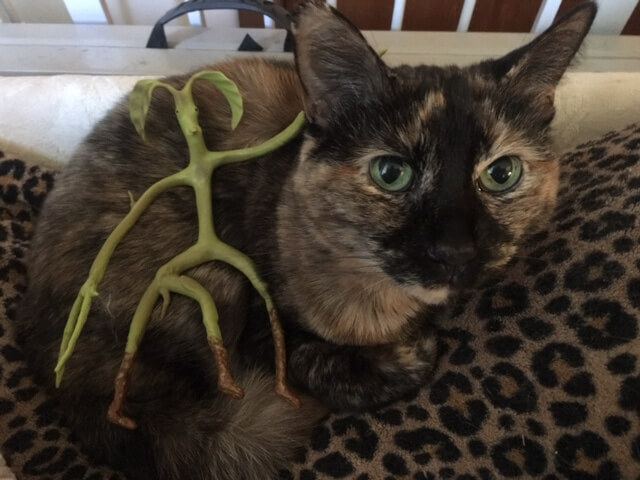 I reached into the vines to pick up the creature, hoping a living plant didn’t bite. The bowtruckle untangled itself with ease, dropping to the floor, and running into the living room. The cat, too busy sniffing the candy jar, ignored the bowtruckle’s flight. I walked into the living room, finding the bowtruckle in plain sight. They are supposed to be shy, but don’t seem to be very sneaky. While the bowtruckle climbed the books, I explained that I wasn’t going to harm it. The bowtruckle looks around, stopping its climb. The bowtruckle scrambles away. I calm my rage. The cat walks in with taffy glued to her fur. Pulling the candy off and removing the fur, I feed the sugary treat to the bowtruckle. The bowtruckle bends over and snatches the taffy. 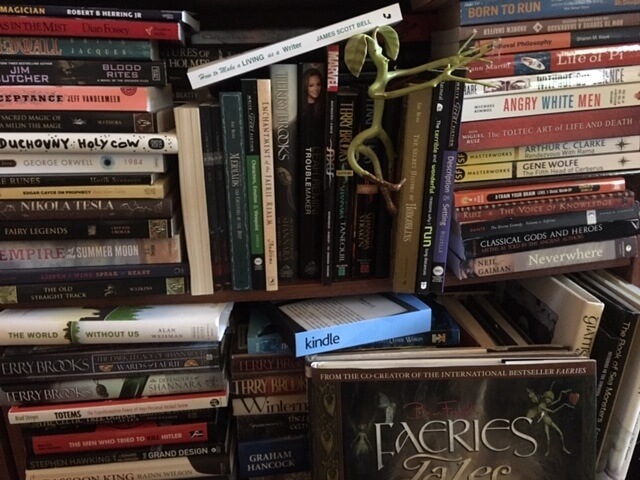 It runs along the book shelf, devouring the treat beside a copy of Faeries’ Tales by Brian Froud, one of my research books that talks about Fae beings and their tales. I can’t help but chuckle. I pass the candy back and forth for a half hour before gaining the bowtruckle’s trust. It bends down, climbing from the shelf onto my hand, then tells me a horrible story. This bowtruckle comes from a place where bowtruckle’s roam the earth in freedom, lazily jumping from tree to tree, guarding the forest. Then came the farmers. After seeing Fantastic Beasts and Where to Find Them, farmers flocked to the forests, snatching bowtruckles from trees and shoving them into cages. They took the prisoners to facilities to breed for mass production. The bowtruckles rebelled, creating problems for the farmers. My candy thief didn’t supply details. The sadness and horror in his face explained it all. There was blood on his hands. He told me how the breeders squashed the rebellion and took away their supply of insects, the bowtruckle’s preferred food. The farmers held the bowtruckles down, injecting them with a mixture of water and sucrose, enslaving their prisoners with sugar addiction. Farmers sell complacent bowtruckles across the world. 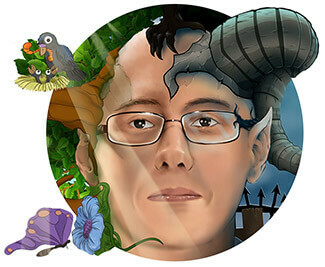 Sometimes people tire of their new pet and throw him into the woods. 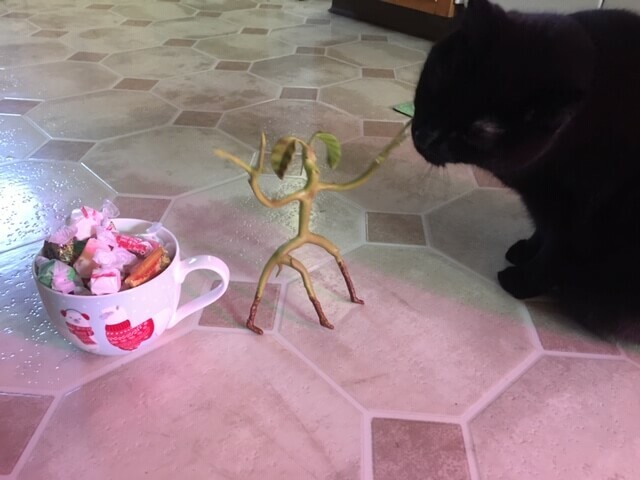 The bowtruckle turns to thievery to get its sugary fix. It seems this bowtruckle and I have something in common, sugar addiction. The bowtruckle and I bonded over our conversation of sugary delights. I introduced him to the cats; Shiloh, Crush, and Vala. The creature needed a name, so we called him Humboldt. We are opening a bowtruckle rescue facility. There will be professional counselors, a sugar rehabilitation program, and an unlimited supply of tasty insects. He is living it up with Shiloh. Rescue your bendable bowtruckle from Amazon. Beware, some bowtruckles overdose on sugar and stiffen. Once they overdose, bendable bowtruckles can no longer be rehabilitated. Stiffened bowtruckles are long gone, slaves to their plastic cages.